At BU, we subscribe to Research Professional, which enables you to find out what funding opportunities are available as soon as they’ve been published by the funder. Research Professional have just launched a new ‘Expressions of interest’ feature which allows you to register your intent to apply for a funding opportunity. You may think, what’s in it for me? Well, this feature will list all users from BU who have already expressed interest in the call, which opens up the potential for cross-Collaboration of Schools. It can also show you the possible level of demand from BU for a call and will be particularly useful when a call has a quota for each institution. This will allow us to see who may apply and put in place processes to deal with quota calls (there may be a need for internal peer review if BU are only allowed to submit one application). It couldn’t be easier to use either. When viewing a funding opportunity you will find the “Express interest” button in the right column and just simply click this. Clicking on this button will display your name in the right-hand column. This will be visible to other users at your institution, alongside a contact button allowing them to email you. All users from your instituion who have expressed interest in the funding opportunity will be listed here. Expressions of interest will also be listed in the ‘Our institution’ section. 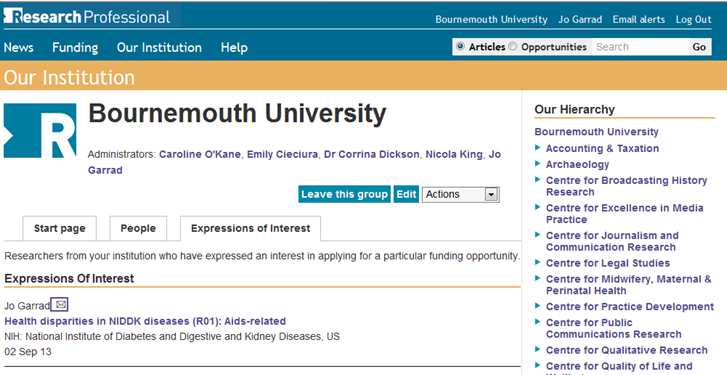 On our institution home page, you will find the ‘Expressions of interest’ tab. Here you will be able to see the funding opportunities you have expressed interest in, as well as any expressions of interest from others at your institution, listed in chronological order. Each Group has its own ‘Expressions of interest’ tab, listing expressions of interest made by members of that Group. If you wish to revoke your expression of interest, view the relevant funding opportunity in the ‘Funding section’. 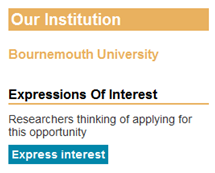 The ‘Express interest’ button will have changed to a ‘Revoke interest’ button. Clicking this button will remove your expression of interest; it will no longer be displayed either on the opportunity itself or in the ‘Our institutin’ section.